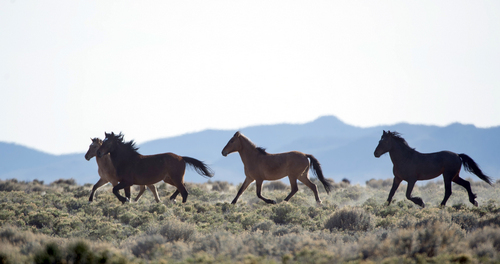 The wild lands in Utah and other Western states where wild horses now roam are fragile and arid  places easily endangered by encroaching, rapidly multiplying horses numbering in the thousands and tens of millions of people who are multiplying even faster and doing more to threaten the land. Two recent incidents demonstrate how shortsighted many Utahns and other Westerners are about the ecosystems they have usurped. A Nevada rancher who opposes welfare for humans is determined to let his cattle graze on land that belongs to all Americans without paying for the privilege. Other ranchers are threatening to round up wild horses to keep them from eating vegetation they feel belongs first of all to their herds. Public lands in the West are part of a legacy all Westerners should want to leave for their children and grandchildren. But if they continue to put what they demand as their due today ahead of preservation for the future, there will be little left of the West for those who want to raise families here. As American Indians learned over many generations on this same land, humans must learn to appreciate the natural beauty, fragility and bounty found here and share the resources with other species, or all of those who live here – animal and human, natives and invaders – will find little to sustain life or make it worth living. We can all claim ownership of public lands: They do belong to us all. But ownership does not give each individual the right to do as he or she pleases. Just as there are rules everyone must follow in order to live within a city or town in harmony with one&apos;s neighbors, there are rules everyone must follow if we are to live harmoniously with all those species who need what public lands provide. Westerners cherish freedom, but there is no freedom for Americans to enjoy public lands after they&apos;re ruined by reckless ATV riders, scofflaw ranchers or irresponsible energy developers and those politicians who encourage such shortsighted behavior.